After the old asphalt was removed, the concrete roof-substrate was found to be in good order and was cleaned and dried before a separating layer of Black Sheathing Felt was applied. This was followed by two coats of Permaphalt laid hot, to a thickness of not less than 20mm in total. 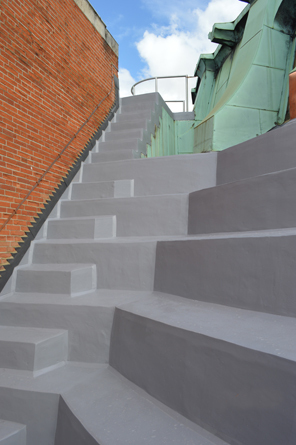 Once cool, the surface was covered in light grey solar reflective paint. This reduces heat build-up in the roof, maximising durability. Abutments to the domes and perimeter presented the biggest challenges, along with negotiating the steps and curves of the chancel roof. The soft brick parapets required particular attention in order to avoid leaks occurring where the new asphalt is dressed against the brick. This interface was managed by the introduction of a lead apron down over the asphalt kerb. The lack of such flashings previously had led to water tracking behind the upstand and becoming trapped beneath the roof covering. Above the lead, a new three-coat lime render was applied on expanded metal lath to the back of the parapet to give further protection against water ingress. 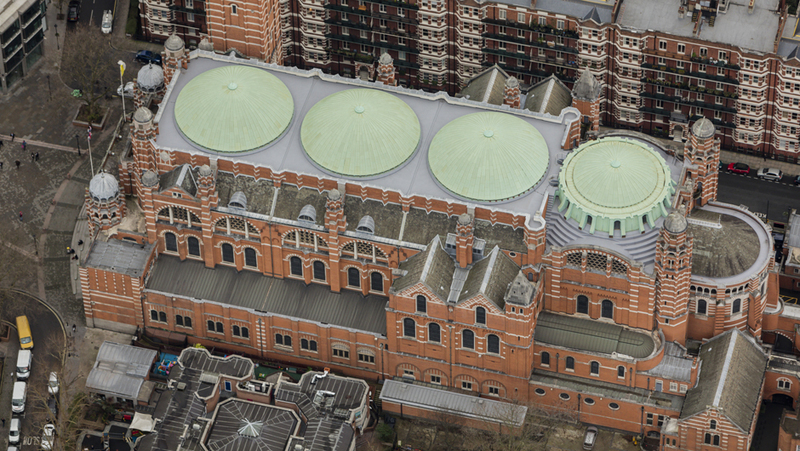 New copper perimeter flashings were added as necessary where the asphalt meets the copper domes. 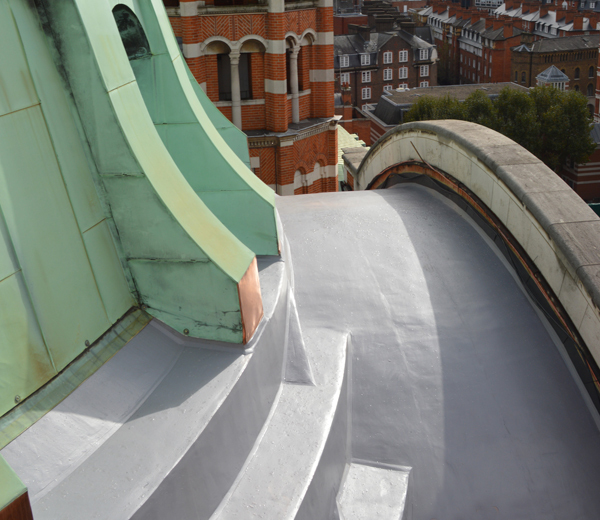 Some panels and clips were also replaced on the copper coverings, which had been added to the concrete domes after the Cathedral suffered blast damage in the Second World War. ‘With the right skilled specialists, when using traditional materials like this the project is relatively straightforward once safe access has been provided,’ Drury says. The £340,000 contract was carried out in a single phase over six months and was grant-aided by the First World War Centenary Cathedral Repair Fund. The project won ‘Best Mastic Asphalt’ at this year’s UK Roofing Awards. SIG Design & Technology is approved supplier for IKO’s Permaphalt.